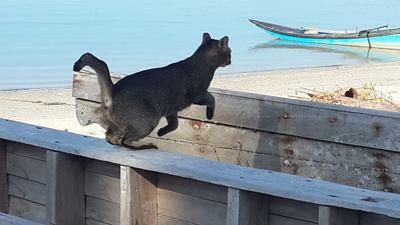 This stray cat lives in a rowboat on the beach near Telaga Harbour, Langkawi Island. It is in excellent condition and is fed daily by an Australian cat-lover couple. Has anyone taken the cat for a rowboat ride? Shows that these cats can do well if someone takes the time to care for them. It reminds me of some of the beautiful pictures I have seen of cats in Greece. 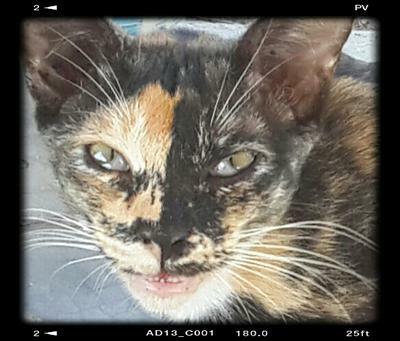 A friendly "wild" cat fed daily by an Australian yachting couple on the Island of Langkawi. My last cat looked a lot like yours. I called her "my female mutant patchwork tortoiseshell lap warmer". 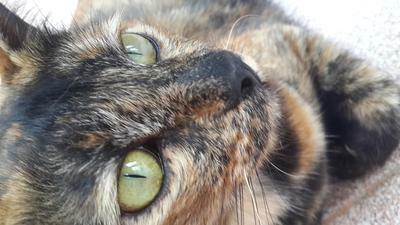 A patchwork tortoiseshell has small distinct areas of color, unlike a smoke tortie, which is more of a muddy effect, and calico, which is large patches of color. I named mine Kaleidoscope, because she had the same line down her face. If I sit down, I have a pet in my lap lol. Guess I'm doing something right :). Rosie has a favorite cat. She runs a shelter for cats and this little one is her best. This puddy tat is paralyzed in her back legs and has to scoot around on her tummy using her front paws as oars. Rosie is a very caring and compassionate human. What a beautiful face. Such a special cat. Beautiful cat. I wonder if your wonderful friend could crowd-fund to get this little one a cart for her back legs? They certainly seem to be available; it is just a matter of connecting with the right people. That would also be great advertising for the work she does and the shelter. I am sorry for u and your cat. God bless u for taking good care of her. 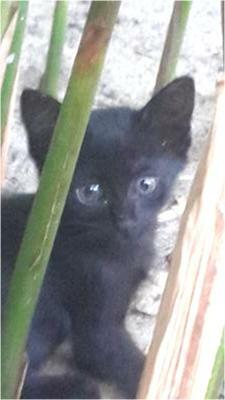 This kitten is hiding on the beach in Pantai Cenang, Langkawi Island. Comments for I can't see you! I'd like to be there too! What a sweet kitten. Is she yours?